My Hollyhocks grow to over 8 feet tall! She literally cries if I bring her inside, but will stop as soon as we go outside again! Just one small sample of the flower colors available. 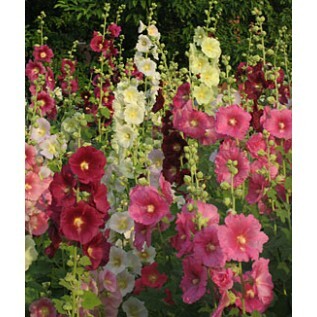 The Hollyhock is a stunning, flowering plant that towers over the garden and comes in a wide variety of colors. Shooting to over 9 feet (2.7 meters) tall, this self-seeding, short-lived perennial (in cold climates, it seems to act more like a biennial) is beautiful, attract bees and other beneficial insects, has a deep taproot that pulls up nutrients and minerals for higher quality mulch at the end of the season, and is edible as well… the flowers are rather bland, but provide amazing color to a salad, and the leaves have a fuzzy texture and grassy flavor that while edible are nothing to get excited about. Likely originating from Asia and southeast Europe. The modern Alcea rosea was likely developed in England. Grown exclusively for its flowers, but it has retained it edibility. Years ago, in certain locations in the U.S. the hollyhock was only planted near the outhouse. The towering spires of flowers could be seen from quite a distance, and this gave the “refined” ladies of the time the ability to find the outhouse without having to ask for it. The young leaves, flower buds, flowers, and roots of the Hollyhock are all edible. Yeah, that’s my 9-month-old daughter’s chubby hand! Decorative – tall, stunning, towers of flowers! Leaves – young leaves are best, either fresh or cooked. They do have a fuzzy texture that gets more course as the leaves mature. The flavor is rather bland with a hint of grassiness… in my experience, it is not that great, but would do in a pinch. I like to add just a few, finely chopped, to salads. I know that the deep taproots are pulling up nutrients not usually found in my garden, so I really only eat them for health reasons… not the flavor. Flowers – eaten fresh. Great color addition to salads. Almost no flavor. Buds are said to be edible, but I have not tried it… I love the beauty of the flowers too much to sacrifice the buds! Tea can be made from the flowers as well. General insect (especially bees) nectar and pollen plant. There is not a single day that I do not see bees on the flowers. Roots can be an edible starch source. Paper from the stem fiber – although this seems to be fairly labor intensive. Traditional medicinal uses are varied. Harvesting: Leaves – when young. Flowers – when present. Hollyhocks are tall plants that reseed easily, so plan well. Chill Requirement: Likely as this is a flowering plant, but no reliable information available. Years of Useful Life: 3-5 years, but as it reseeds so easily, it can be treated almost like a long lived perennial. I like to help out the self seeding process by scattering seeds where I want them and lightly covering with soil/mulch. Honeybees really seem to like Hollyhocks. Growth Rate: If in mild temerature regions, the plant will stay green and small until the Spring when it shoots up tall seemingly overnight. In cold regions, where it acts as a biennial, it is a fast growing Spring flowering plant. Hollyhocks’ beauty is enough reason to plant them, but they have many other attributes. Every year I grow Hollyhocks, the towering stalks of flowers seem to topple over, and these plants are not exposed to much wind. Fortunately, my Hollyhocks have been planted on a fence line. I just tie them back up with a few strands of twine, and they do just fine. Maybe I have a weak-stemmed variety, or maybe this is normal for the species. Consider growing this plant close to something that can support it if need be. Tolerates juglone (natural growth inhibitor produced by Black Walnut and its relatives). Consider planting Hollyhocks as a buffer between your walnuts and other plantings. Propagation: Easily from seed. The flowers produce quite large seeds that easily germinate. Root cutting is possible, but I have not tried it. Minimal. See “Special Considerations” above. Some varieties (and regions and planting location) are more susceptible to rust. Toward the end of the flowering season, my plants are routinely attacked. After seeding, I cut back the plants and add them to the compost bin. I’ve not had any issues otherwise. Can reseed fairly easily, so can be seen as “invasive” or “spreading” by some. I’m all for it. 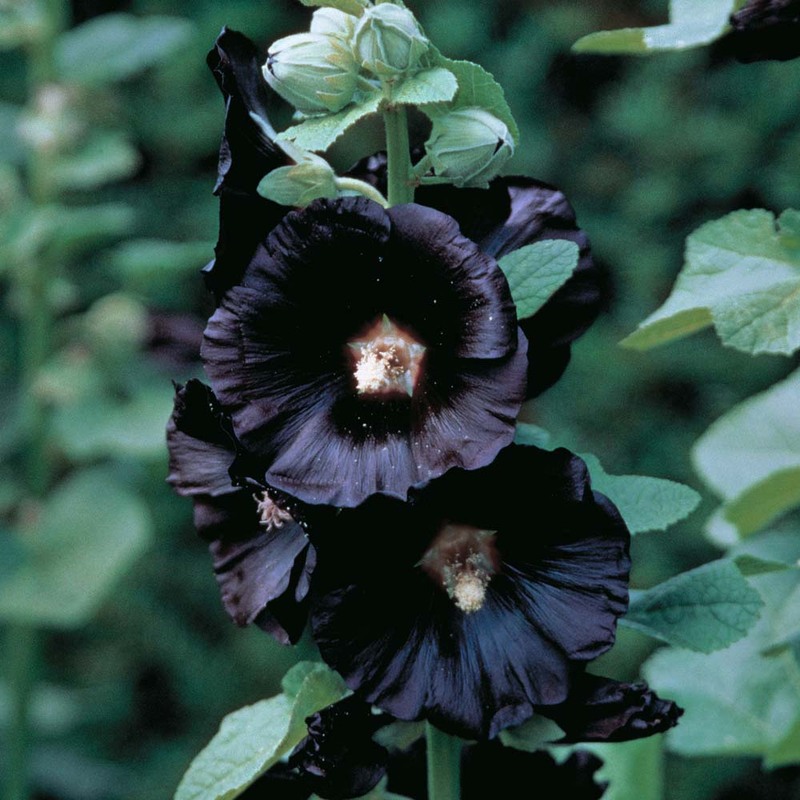 The stunning Black Hollyhock (Alcea rosea nigra).